It’s coming down to crunch time this holiday season and, since gift-giving is already difficult to begin with, the pressure is on. 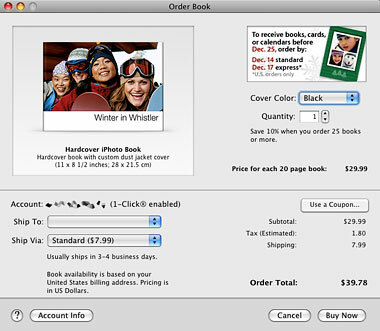 No worries… you can put that extensive iPhoto library to good use and order Apple’s professionally printed products to create the perfect gift at a decent price. One of the most under-appreciated features of Apple’s iLife suite that comes free with every Mac is the ability to create and easily order quality printed products in iPhoto. Using the photographs you have in your iPhoto library, you can effortlessly put together hardcover photo books, beautiful wall calendars, customized greeting cards, and more. With a few clicks, one-of-a-kind keepsakes can be ordered and delivered right to your door. But hurry — December 17th is the last day for guaranteed delivery before Christmas! You’d be surprised how terrific these items turn out — I’ve ordered calendars for family members the past few years and have been blown away by the print quality. At less than $20 (not including shipping), they’re truly great gifts for both your wallet and the recipient. To get started, launch iPhoto and look at the bottom toolbar. There you should find buttons for Book, Calendar, and Card. Clicking any of them will reveal a window with several pre-made templates, product sizes, and pricing details. Choose the one you’d like to work with (in this case, I’m going with a photo book). If you did not have any images selected, you will be greeted with a message that gives you the option to automatically bring your entire library into the project or let you manually drag photos as you go. If you’ve got a large library, it would be a wise idea to select Add Later. Now looking at a blank canvas, let your creativity run wild. 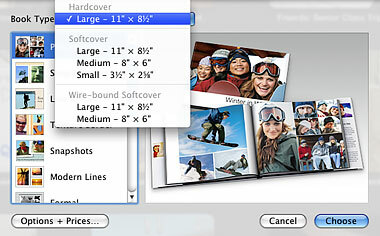 To add photos, drag images from your library directly to the project’s name in the sidebar. Then you can use the built-in tools to change themes, alter layouts, add pages, insert text, and much more. It’s almost impossible to make Apple’s pre-designed templates look bad. With your own personal photos, they’ll look even better. Once you’re finished creating your project, click the Buy Book (or Calendar, Card, etc.) button and fill in your payment information. Since time is running low before Christmas, remember to go for Express Shipping and order no later than December 17th if you want it before the 25th. From my experience, Apple is known to under-promise and over-deliver so you may be able to order a tad later or go with Standard Shipping if you’re feeling lucky. I wouldn’t take that chance, though. When your creation arrives, you should be extremely satisfied with the final product. Apple does a fantastic job with these and such a thoughtful, personalized gift will surely please the person you’re giving it to. But make it quick — the clock is ticking!